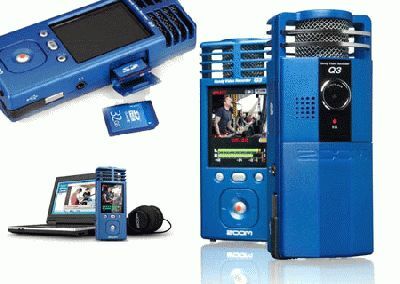 Zoom, makers of award-winning professional audio recording devices, announced today it is dropping the price on the Q3 Handy Video Recorder to $199. The Q3 records stereo sound with two condenser microphones, which allow users to capture crystal clear HD audio with their movies. The ability to capture audio at 24-bit/48 kHz is especially important for users planning to upload their footage to video share sites like YouTube, which compress video but allows files with stereo audio at 44.1 kHz, CD quality. The Q3 is also the only point and shoot video camera that will handle the high decibel levels found at live concerts. Customers looking for testimonials and endorsements of the Q3 should check out the dedicated microsite www.soundmakesthemovie.com. The site features videos made by musicians in performance and rehearsal situations that showcase the Q3’s recording capabilities. From metal and rock performers Dream Theater, Lamb of God, Shadows Fall and Shinedown to jazz musicians, Peter Erskine and Alan Pasqua, and even educational footage from USC’s Thornton School of Music, the site is regularly updated with new content from an ever growing list of artists and applications. The Zoom Q3 is available now for $199.